As a popular porch and patio option, retractable screen doors show the many benefits of using this type of door. Homeowners are noticing the importance of a retractable screen door and are beginning to use them in different areas of the home. What makes this popular door an ideal option for any type of home? One benefit is that you can enjoy the fresh air while being indoors. If you have to be stuck inside instead of outside soaking up the sun, what better way to spend time inside than while getting fresh air due to a retractable screen door? Without a screen door you would have to leave the door open for insects and dirt to come into your home, something nobody wants. 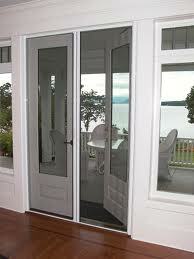 Another great part of having a retractable screen door is that it provides a ventilation system in your home. With a solid door, all doors and windows closed, your home is keeping in the same air which accumulates dust and particles that are not enjoyable. However, if you have a screen on your door you can get fresh air coming into your home, giving it a clean and refreshing feeling inside the home. One thing homeownerâ€™s worry about is the look of the door. As retractable screen doors grow in popularity there are more styles and colors available. You can get a door that matches your windows or your siding, has a good siding to it and creates an elegant look for your home. You can retract the door when it is not in use so that you donâ€™t have to see it and have it in the way. By keeping the screen retracted you are also protecting it from any damage that could happen to it while it is in use. They work for a wide variety of doors. A retractable screen door will work on entry doors, French doors, in-swing and out-swing doors, sliding doors, patio doors, and other varieties of doors that exist in your home. They will also work in any type of home whether you have a single family home, condo, or apartment. Now that you know what a retractable screen door can do for your home, it is a simple and easy installation process that can be done in a short period of time. Itâ€™s a decision that is going to make your home more comfortable and enjoyable as you spend time inside using the door. Want to talk about it some more? Click on the Contact Us tab and complete the information. We will be in touch with you shortly!